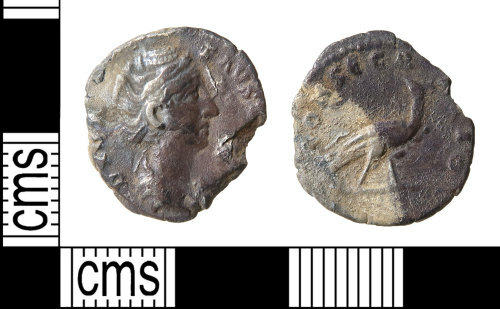 A silver Roman denarius of Diva Faustina (AD 138-161), dating to the period AD 141-161 (Reece period 7). CONSECRATIO reverse type depicting a Peacock walking right head turned left. Mint of Rome. As RIC III, p. 73, no. 384. The crescentic shadow across the reverse suggests this coin was originally deposited with at least one other and is probably part of a hoard. Reverse description: Peacock walking right, head turned left.